One of our most popular flowers! 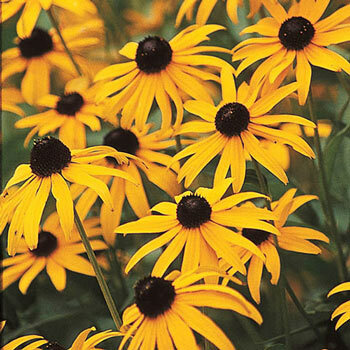 With its charming, daisylike blooms and well-earned reputation as an easily-grown, long-blooming perennial, it's no wonder that Goldsturm Rudbeckia, aka Black-Eyed Susan, is so popular with gardeners. Its flowers—sunny yellow with a nearly black center cone—resemble targets, which is just what they are to butterflies and bees. But as much as beneficial pollinators savor their flavor, deer find the flowers unappetizing and tend to avoid them. This variety, which grows 24–36" tall and 18–24" wide, positively shines in a bouquet of freshly cut flowers. Tolerates clay soils and mild drought conditions. Ships garden-ready in a 1-gallon pot, ideal for filling bare patches due to its ability to spread quickly.